And during this time, if you work with Hollywood FX, you won't be able to use a number of plugins included in Hollywood FX. 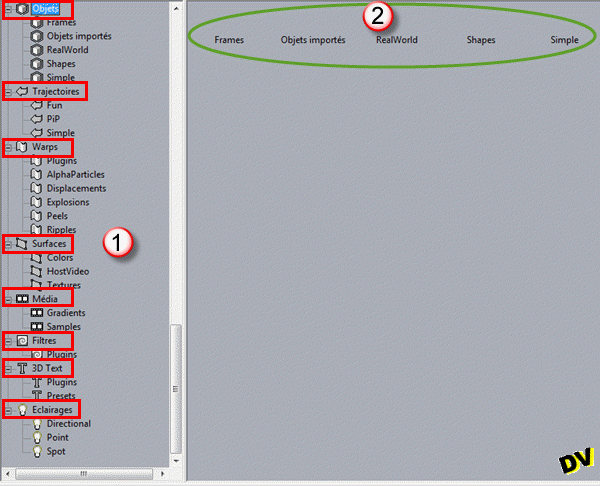 So I suggest you bypass these bugs by tinkering with Easy_FX so as to get full use of the Warps and 3D Text effects. It must still be noted that when the Hollywood FX plugin is called from Studio, these annoyances are less important and cause fewer crashes. I will not talk about bugs that don't cause crashes. I will content myself to talk to you about the tree for the default album. When you open Hollywood FX, this is what you can see at the bottom of the default album tree (middle panel of the interface). As you can see, if you click a group effect (marked in red). the icons are missing in the details pane on the right. But its not being blocked. IF you use Hollywood FX in standalone mode or just call it from Studio, there are three places where it is dangerous to click, at the risk of possibly crashing Easy_FX.exe or Studio. On the "Plugins" icon of the Warps group. On the "Plugins" sub-folder of the Warps group. 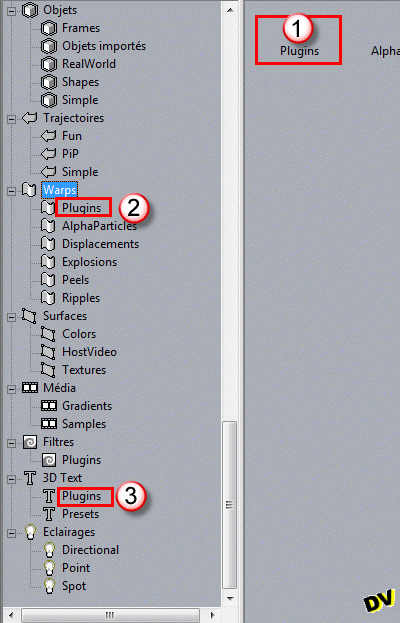 On the icon and the "Plugins" subfolder of the 3D Text group. Depending on the configuration, clicking the subfolders may shut down Hollywood FX or Studio and you won't be able to access Warps plugins or 3D Text. Therefore, I propose to adapt your Easy_FX so as to recover these inaccessible plugins. 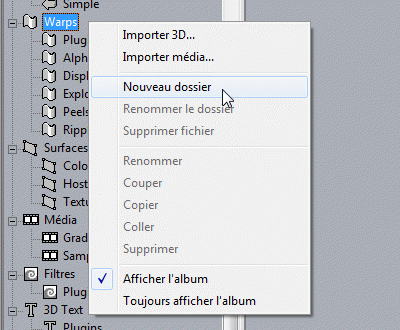 Select the Warps group then right click and select New Folder. Rename the new folder to your liking. Do the same in the 3D Text group. Your Warps group might look something like this. Your 3D Text group might look something like this. 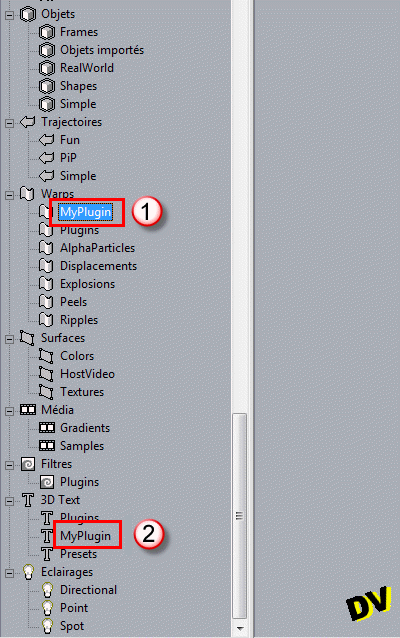 It is not possible to recover the missing plugins but it is possible to recover default pre-configured effects of missing plugins. This is what we will do. 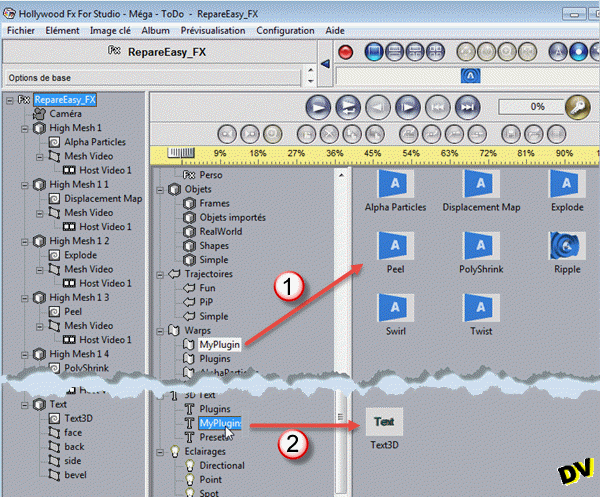 To retrieve these default pre-configured effects, download the RepareEasy_FX.ZIP file, in the "Associated File(s)" section at the bottom of this tutorial (right click + Save Target as ... to download the file). Then unzip the zip file and unzip HFZ file. 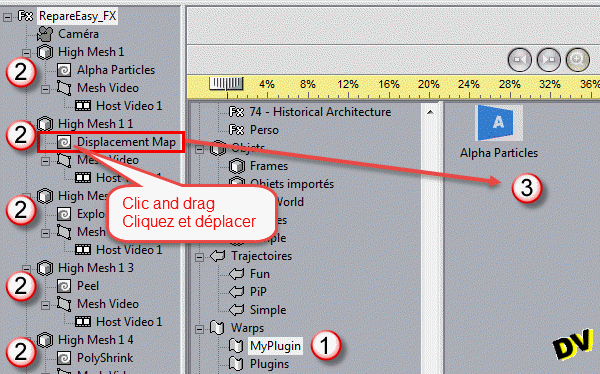 It will install itself in the "Perso" folder in Hollywood FX (Easy_FX.exe). Double click the RepareEasy_FX icon. Check that the effect tree has been updated as shown on the right. Select your new Warps subfolder. Drag them, one by one, to the detail area of the album tree. Repeat the same procedure for the 3D Text plugin. After completing these operations, your album should look like the screenshot on the right. I am having a similar problem.I even added a Perso folder to the Fx tree so it looks like the tutorial.I have Win 10 and it does not have a "save target as", instead the only similar command is "save link as". This results in a 7KB download which is already extracted consisting of "Icon RepareEasy_FX 12/27/2015 4:49 Hollywood FX Co... 7KB"
It will not install even when I open it with the InstallHFZ app.. I get the same error message napshare reported. I read the tuto and the only part that seemed to apply was the part on making sure the correct app. was being used to open the file. What am I missing? The HFZ associated file was good but the extension is not supported by our file manager. I transformed the HFZ file in ZIP file and now it should be good. Is this bug reported by Corel / Pinnacle if not I need this message still got through knows immediately through the site all of Studio UT E driver: stand. Can I run the Batch for W10 or should I change it to edit. Thank you Le Papy, once I downloaded the new zip file, following the tutorial, all works fine now. @ casper01 : Sorry I don't understand your request. There is no need to use a batch program.